I was talking to my mom about wanting something sweet to eat but not knowing what I wanted. She told me about a recipe she had got at her Weight Watchers meeting. She has been making it ever since and always has it on hand for her and my dad. It is a no baking involved desert that makes a good snack too as there is protein in it to help keep you feeling full. She gave me the recipe and I tweeked it for me. I cannot use artificial sweeteners so I used regular Instant Pudding and Lite Cool Whip instead of sugar free. If you make the recipe as I do it comes out with a Points+ Value of 4. If you make it using artificial sweeteners it has a Points+ Value of 3. In a large bowl, mix the pineapple, the drained mandarin oranges and the vanilla pudding together. 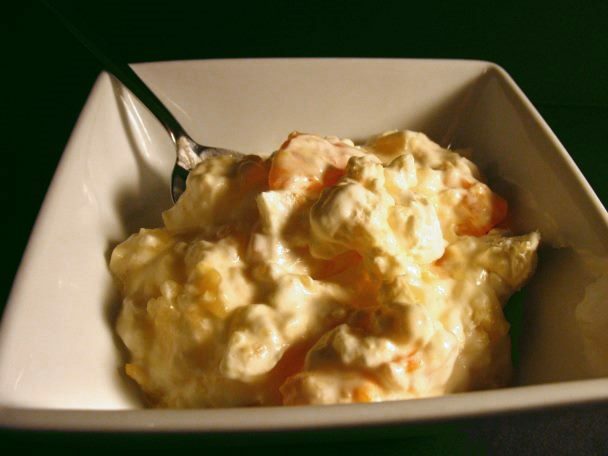 Mix in the cottage cheese or Greek yogurt. Fold in the Cool Whip. Refrigerate for a couple hours. I see this is 3 points, do you know how big a serving is and how many servings this makes? I calculated the points using 1 cup as a the serving size. The NuCaptcha API requires the PHP mcrypt module.